We didn't go off in search of Sanquhar, we just skidded to a halt when we saw it from the road. (This was a common occurence on our trip -- "Stop! Stop! A pile of rocks!"). This grand pile of rocks was right outside of the town of Sanquhar. Most towns of any size have a tower or castle ruin somewhere, which makes sense -- most towns were built around some sort of fortification, right? 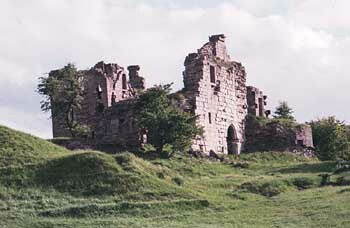 Sanquhar Castle is a ruined 13th century castle, with an altered keep and ranges built around a small courtyard. 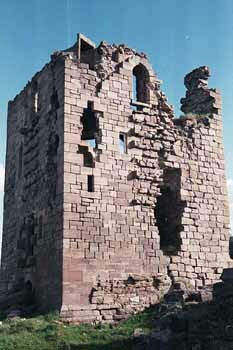 A crumbling 4 storey tower dominates the ruin, with a ruined hall block and gateway passage and semicircular tower also remain. The castle is not posted as dangerous, as are many of the privately owned (or non-Historic Scotland) castles, but it doesn't look very stable to me. 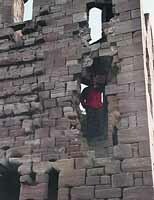 Mark, of course, scrambled up into the ruined tower despite the gaps in the stone and precarious stairs. The lands originally belonged to the Ross family, but passed by marriage to the Crichtons (see Crichton Castle) in the 14th century. The four storey ashlar-faced tower is all that remains of the original structure, although it was probably intended to be one of four towers in the couryard by 1380. The design may have been changed before completion circa 1400. On the south-west side of the couryard is a set of very ruined service rooms of the late 16th century, although we had a hard time picking out the shape of the foundations. The round stair turret (visible here as the stumps of stairs running up the wall) between the old hall and guard room and the connecting walls are all now reduced to their foundations. The Crichton family were made Earls of Dumfries in 1633, but in 1639 sold the property to Sir William Douglas of Drumlanrig (later Duke of Queensberry). The 1st Duke built a new castle at Drumlanrig, but after staying in it only one night, decided he did not like it and moved back to Sanquhar. The family moved to Drumlanrig after his death, and Sanquhar was abandoned. Reconstruction did not occur until the 19th century. The 3rd Marquis of Bute started rebuilding Sanquhar Castle in 1896, but this was stopped at his death in 1900, and the castle has been left to crumble. Two ghosts reputedly haunt the castle -- one is a "White lady", a spirit of a young woman, Marion of Dalpeddar, who disappeared in 1580 and may have been murdered by one of the Crichton lords. A woman's skeleton was found in a wall during excavations in 1875-6, which might support this story. The other ghost is that of John Wilson, hanged by another of the Crichtons, who manifests himself with groans and rattling. The Chrichtons weren't terribly nice people, were they?